Chris Scott and Patrick Dangerfield. THE MOVERS and Shapers survey is back for 2019. This survey of administrators, players, managers and media, now in its fourth year, has again established the definitive list of the most influential people in the game. It's the list whose members claim to pay no attention to, but are secretly thrilled to get a guernsey. The top 50 includes groundbreaking broadcasters, a veteran coach, the most powerful West Australian in the game, a former "mad scientist in shorts", plus AFL executives and politicians. It is a reflection of the AFL's desire to keep the Commission relatively young and nimble that Bassat is the second-longest serving member behind chairman Richard Goyder, having come on board in 2012. The whip-smart SEEK co-founder, who has his own global venture capital firm, is the League's sounding board when it comes to high-tech and the digital start-up scene and is a confidant of Gill McLachlan and Goyder. His older brother and fellow SEEK co-founder Andrew is the president of St Kilda, having won a power battle with former Saints chief executive Jim Watts to take over the position when Peter Summers stepped down at the end of last season. West Coast is a giant club, laden with "structures and hierarchies" according to a close observer. Yet what Simpson has brought to the club – apart from the 2018 flag – is the homespun common touch he learned from his 306-game playing career at North Melbourne, the humblest club of all. Simpson cares deeply about the players, which is why they are so clearly invested and enjoy playing under him. He finished playing recently enough (2009) to have an appreciation of what the modern game entails and his communication with his players is very much a two-way thing. Collingwood's barnstorming run that ended just two minutes shy of winning the 2018 flag has added to the Magpie content in this list and it includes the skipper, who played a quiet, but key role in last season's transformation. Pendlebury is very much a product of the 'do as I do' school of captaincy, but his meticulous preparation and single-minded determination to get the best out of himself has rubbed off on his team and his club. Collingwood's abundance of midfield talent means he could play more across half-back this year. One of Steve Hocking's sweeping changes before the start of last season was axing the three-person Match Review Panel and leaving Christian as the sole arbiter of the AFL's judicial processes. It's a big workload for one person, but the streamlined process means a quick turnaround after Thursday and Friday night games, followed by Monday afternoons when the football world grinds to a seeming halt awaiting his verdicts. There were questions over consistency at times last season, particularly with regards to the bump and umpire contact. Here are a couple of indicators about how well Gale is regarded. The first is that his own club CEO tree has taken root, with Cain Liddle now in charge at Carlton. The second is that if you were framing a betting market for Gill McLachlan's eventual replacement at the AFL, Gale would sit at the top. With the 2017 flag (and the chance of more premierships to come), 100,000 members, loads of cash in the bank and plans afoot for the expansion of the club's footprint at Punt Rd, Gale has achieved so much in almost 10 years in charge. Not many club bosses are adored by their fans, but add his 244 games as a Richmond player to the huge strides made off the field and that makes him a genuine exception. Richmond presidents are supposed to serve a maximum of only two three-year terms. But the Tigers know they're on to a good thing with O'Neal who, in her usual quiet and no-fuss manner, recently agreed to a third term as the board chair at Punt Rd. Given the incredible achievements and growth at the club, it was a wise move to get her to agree to stay and she is on track to becoming just the second woman to receive life membership of the AFL. The Punt Rd redevelopment is her next big project and, with four Richmond teams but still only one oval, her renowned process management will come to the fore. "A place where everyone feels at home, a place to thrive and win," is her operating philosophy at the club, and one she has been able to follow through with. Her partnership with CEO Brendon Gale is the best of any in the game. Footy's longest-serving club chief executive, he recently celebrated 20 years with the Cats, having been at West Coast in the same role for 10 years before that. 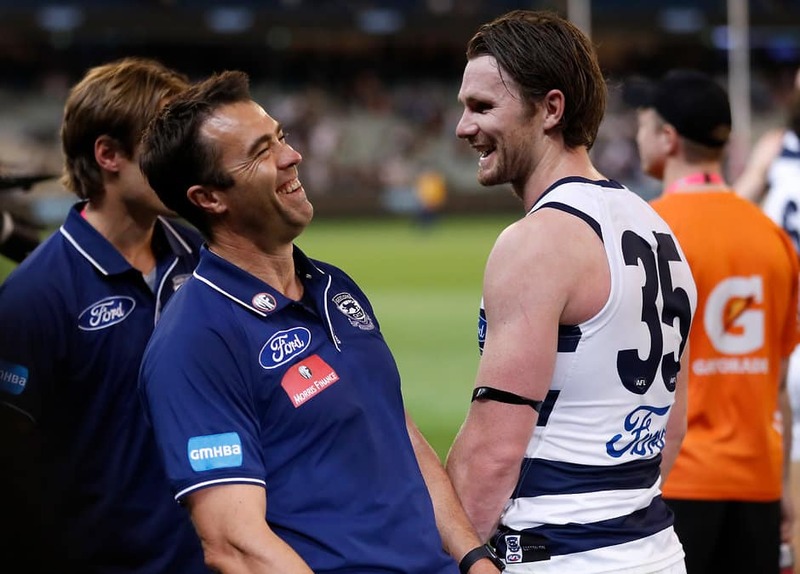 The Cats are a commercial juggernaut and a football powerhouse, and it was the systems and structures implemented by Cook that helped get the club back on its feet and on its way. Just about every club in the competition has had a nibble at him at some stage and it is instructive that several of his key offsiders, Stuart Fox (Hawthorn, then the Melbourne Cricket Club), Justin Reeves (Hawthorn), Steve Hocking (AFL) and Rosie King (Netball Victoria), have gone on to senior sports industry positions. While his role at Geelong has always been over-arching, he conducted a 'health check' of the football department after last season's disappointing eighth-place finish that will lead to several tweaks to how the Cats go about things this year. He is committed to the club for at least two more years. Entering his sixth season with the Swans, Franklin is still in the meaty, middle stages of a staggering $10 million, nine-year deal to cross from Hawthorn. The support cast around him is starting to fade, but Franklin's magic more than anything helps the Swans remain super competitive. And as the most watchable and dynamic player in the game, he makes sure the Swans are the No.1 winter box office attraction in what is both the media capital and the most competitive sporting market in Australia. Franklin will play his 300th game this year and the accompanying highlight reel might be the best to mark the occasion. But the Swans appear further away from a premiership than at any period in his time, so cue the discussions about whether he is truly worth the money. It says here that he is. It is unlikely there has been a better administrator north of the Murray than Ireland, who stepped down as chief executive of the Swans at the end of last year. He took the Brisbane Bears from a laughing stock through the merger with Fitzroy to their first flag as the Brisbane Lions. He then moved to Sydney and was involved in two more flags there, while establishing the Swans as an AFL power. His last act was the deal to establish a new club base at the Hordern Pavilion and the old Hall of Industries alongside the SCG, labelled by one AFL insider as "the best club project I have ever seen". Despite moving back to Queensland, he will remain a director of the Swans, having been courted by several clubs, but of more consequence is his board position with Sports Australia. His counsel will be invaluable for the entire sporting industry. The $250 million makeover of Marvel Stadium – funded jointly by the AFL and the Victorian Government – will start at the end of the season and will be presided over by Gunston. He is also chairman of the stadium and, in the short term, needs to make sure the new and improved revenue arrangements for tenant clubs Essendon, Carlton, St Kilda, North Melbourne and the Western Bulldogs work better than they have in the past. The AFL has infrastructure projects in play all over the place – Ikon Park is the latest to be announced – as well as one of its own, with a move to new digs down the road in Melbourne's Docklands precinct planned for the next few years. With years of commercial and sports management experience under his belt, Gunston is one of the most respected people in the game. And he is highly regarded inside the AFL. Over the course of the season, every key football person – official, coaches and players – will appear with Healy on one of his high-profile, high-rating media platforms. And while his background in the game was as a superb player in 211 games for Melbourne and Sydney, his 25 years in the media have made him one of those increasingly rare media types with a deep knowledge of all aspects of football. The man who introduced us to 'Clarko's Cluster' and the 'Weagles Web' is equally adept at discussing the off-field direction of the game. For all his media platforms, Healy's influence is best utilised over the quiet coffees he regularly shares with many of the game's leading figures. The biggest name in the women's game, she is a star player on the field and a respected voice and opinion-shaper off it. "People just relate to her," said one AFL marketing person. It is clear from listening and watching Pearce that she knows her stuff, and there is not even the merest hint of tokenism in anything she does outside AFLW. But now there is an added twist. Pearce did not play this season after delivering twins Sylvie and Roy in February, but she fully intends to return to the field next year. How she performs then will be "instructive for generations to come," noted one commentator. Grow a beard, loosen the reins a bit and, before you know it, the Magpies finish two minutes and a clutch Dom Sheed kick away from winning the 2018 flag. Collingwood people will tell you that the changes to Buckley's demeanour were apparent the year before, but it took the post-season review by football boss Geoff Walsh for Buckley to fully immerse himself in his new, chilled persona. He took that a step further by stepping away at the end of last season for a sabbatical in Italy. His lengthy absence from the club was a bit deceptive in that he missed only one week of summer training and was still involved in key decisions via FaceTime, but given that imitation is football's greatest form of flattery, look for several other coaches to take Roman holidays of their own if the Pies play deep into September once more. With 250 players plus a handful of coaches and high-profile media members in its stable, TLA is the leading management company in the game. The absorption of Stride Sports into the business went down swimmingly and it was former Stride boss Tom Petroro, now the AFL lead for TLA, who cleared a significant logjam during the trade period that eventually moved Jesse Hogan and Rory Lobb to Fremantle, Lachie Neale to Brisbane, Steven May to Melbourne and Chad Wingard to Hawthorn. Kelly, who is close to the AFL and in particular a sounding board for Gill McLachlan, sold Elite Sports Properties to TLA Worldwide in 2015 for $25 million, but might yet buy it back now that the global business has been sold. TLA holds significant marketing, licensing and event agreements with the AFL and made headlines last year with plans to take over the TAC Cup competition, a development that didn't entirely thrill rival player managers. He might not have as many players in his group as TLA, but when it comes to star power, his 100 or so cannot be beaten. His team, which includes business partner Robbie D'Orazio and the industrious Mel Oberhofer, helps mould the premiership race each year simply with the moves they help engineer. Last October it was Tom Lynch to Richmond and Dylan Shiel to Essendon. Andrew Gaff's decision to remain with West Coast is a huge boost to that club's hopes of back-to-back flags. All eyes are now on Josh Kelly – he stays and the Giants' flag hopes remain high. "He actually plays a role in shaping the competition," said one broadcaster. As the main conduit between the League and the clubs, Auld plays a critical role. When they're not happy or need some clarification, he is their first port of call. He was the first chief executive of the Suns, so he has walked in their shoes. But his most high-profile role each year is to manage the AFL's fixture. It is an incredibly complex process that takes several months to prepare, even with the sophisticated software and the various equalisation measures that get plugged in. Who the clubs play, where and when can have major ramifications for on-field performance and clubs' bottom lines. He took some justified heat from the prominence given to lowly Carlton in last year's fixture and will be hoping that Essendon, which this year figures heavily in the prime-time schedule, justifies the faith placed in it by the AFL. A meeting of the Victorian club presidents at his office last May addressed a perceived lack of communication and transparency from the AFL and, as a result, many of the clubs are dealing with the League with firmer resolve. Entering the second season of his second stint as Hawthorn president, he has plenty to keep him occupied, including the fight to maintain the club's presence in Tasmania and the move to Dingley, which seems to be blowing out in terms of cost by the year. He'd also like the AFL to fast-track plans to bring the club into the AFLW. What is harmonious is his relationship with equally hard-headed Hawks coach Alastair Clarkson and, publicly at least, they're singing from the same song sheet and share grand ambitions for the club. Rupert Murdoch signs the cheques, but figures such as Foxtel boss Delany, Fox Sports head Campbell and Fox Footy general manager Neill have an enormous say in how the game is broadcast. The depth and breadth of Fox Footy's AFL coverage is impressive. The game-changer in 2019 could be the new Kayo streaming service that will carry all of Fox Footy's coverage for $25 a month, putting it in direct competition with Telstra's Official Live AFL App. From the launch last spring, the numbers were impressive and, if the service is well subscribed through the season, it adds a new dimension to the next media rights deal. Informal discussions will start this year over that deal ahead of the serious number-crunching this time next year. There is no formal deputy chief executive officer of the AFL, but Dillon is universally regarded as having the closest relationship to Gill McLachlan of all the AFL's management team. He manages several meaty areas of the AFL including player rules, the draft and game development, while integrity issues are an increasingly important aspect of the game. McLachlan rarely acts without bouncing his ideas off his cool, calm and collected close mate who sits in the next office. "He's the voice of reason over there," said one industry observer who knows him well. "I don't think his heart rate ever rises above 50." Wilson slips out of the top 10 for the first time, which corresponded with her first year of 'semi-retirement'. Her role with The Age has been reduced to one column a week, although it must be said that piece regularly packs a punch. She is a staple on 3AW and Channel Nine's Footy Classified and appears regularly on the ABC's Offsiders. She remains the trailblazer for women in football and trumpets that issue regularly, as she does issues of governance and management of the game. She also has strong feelings about the struggles the game is facing in Tasmania and the AFL's complicity in that. "Hers is a strong voice and she's trusted behind the scenes," said one fellow senior journalist. Took to his new role with SEN in 2018 like a duck to water after his surprise departure from the ABC and his morning show was a who's who of the big names in the game. The same with AFL 360, his nightly Fox Footy panel show that wraps up the news of the day and often sets the agenda for the next. Crocmedia (owner of SEN) has invested heavily in Whateley and with 145,000 listeners a week, the ratings figures towards the end of the 2018 AFL season began to reflect this. "He runs the conversation and debate about the game day and night," said one fellow broadcaster. "He plays well across various forms of media and has access when it matters." What will be interesting down the track is what will happen when the great Bruce McAvaney calls it a day at Seven. Would Whateley – whose prowess at calling not just footy, but horse racing, cricket and the Olympics, mirrors the sports that Seven holds the rights for – be interested in one day filling those illustrious shoes? Having delivered AFL players a hard-earned but well-received CBA agreement before the start of last season, Marsh then delivered a nice deal for AFLW players as well, with player payments across the 10 clubs totalling $4.478 million in 2019, an increase of 38 per cent a club on 2018. His main focus outside terms and conditions for the current crop of players was the AFLPA's Injury and Hardship Fund, a $25 million initiative that it is hoped could assist up to 200 past players a year. Players are tipping in $4 million from their share of industry revenue to finance the fund.This year, attention will likely turn to a review of the illicit drugs policy. Things between the AFL and the players are generally quite harmonious, and while they were well paid for turning up, they threw their enthusiastic support behind the AFLX event at the end of February. Unlike predecessors Andrew Demetriou, Brendon Gale and Matt Finnis, Marsh isn't considered any chance to work at the AFL or become a club chief executive. He has delivered well for the players and they are likely to want him to remain for considerably longer. "He is determined to create a long-term vision for the players outside the confines of the AFL," said one associate. The next CBA isn't due for some time, but he might become the first AFLPA boss to negotiate more than one. Here's something to consider. If scoring increases this year because of the new 6-6-6 rule, then one of the winners will be Seven, the AFL's long-standing free-to-air TV broadcaster. More goals means more ads. More ads means more money. Don't think for a moment Seven proprietor Stokes and his senior management team aren't delighted with the new rules and interpretations designed to increase the flow and the spectacle of the game. In all likelihood, they made their views clearly known to the AFL. Managing director Worner, a former Sydney Swans director who races horses with Gill McLachlan and is good mates with the AFL boss, told The Age last year at the height of the rules debate: "I want more goals ... that's the most valuable 30 seconds of screen real estate in Australian television, aside from the 30 seconds after an over." We are still a few years away from the AFL's next round of media negotiations, but if recent examples overseas can be taken as a guide, TV rights fees are starting to flatten out and perhaps even slightly decline. So if scoring is up and Seven can help sell more fast food, cars, beer, banking services and sports betting, then football stands to benefit down the track. At least that's the theory. It all seems so effortless for the 2016 Brownlow medallist, who can glide seamlessly between starring for the Cats, juggling various media roles and some business interests and heading up the AFLPA. If anything, football was a bit of a struggle for the 28-year-old, who battled a nagging back injury last season. He was good, rather than great for much of the year but has reportedly trained the house down in preparation for the coming season. But as a media performer he earned maximum votes, and as a social media influencer he earned huge praise as well. "He gets the importance of interacting with the media and sets the tone for his peers. Where 'Danger' goes, others will follow," said one senior journalist. He hasn't been an extremist as the players' leader by any stretch, but he makes sure their views are known and communicated to those who need to understand them. The consequence of the hard-fought CBA win 12 months ago was that the players threw their support behind ventures such as AFLX, for which he was a team captain and No.1 spruiker. "His opinions are sought on the decisions that matter," said another observer. He lasted less than 12 months as host of The Footy Show in 2017, yet his star has risen further since. Having already established AFL Nation as the largest AFL radio broadcaster in Australia, Hutchison spent 2018 bringing 24/7 sports broadcaster SEN 1116 into the Crocmedia empire. Not content with one station, however, he now has two, with SEN+ broadcasting on 1377. And SEN is now back in Adelaide as well, with several hours of specialist programming for the South Australian market. But he didn't stop there. In July he forked out $8.1 million to buy the League's publishing assets, including the AFL Recordand the AFL Season Guide. With some TV properties also part of the mix, and the ever-popular NAB AFL Trade Radio racking up huge streaming numbers each October, Crocmedia is now a major part of the AFL media scene. His annual Super Bowl trip is increasingly regarded as a networking opportunity, with senior AFL executives and commissioners, and other key stakeholders taking part each February. "He has too many assets not to be influential. He is now the biggest media player in the game," said one observer. "He sees the big picture." McGuire's influence comes from his various media platforms, the club he presides over and 20 years' experience at said club. The media like to tag him as 'Eddie Everywhere', but 'Eddie Everyone' might be more appropriate. There is perhaps no one in Melbourne as comfortable in the corridors of power across sport, business, the media and politics, and that's why he remains such a player. He didn't get his dream of a new stadium across the road from the MCG (and conveniently close to Collingwood's Glasshouse facility at the Holden Centre), but he helped broker the $250 million deal between the AFL and the Victorian Government that keeps the Grand Final at the MCG until 2057, gives Marvel Stadium its much-needed facelift and provides infrastructure for grassroots football across the state. He is also part of the League's new Competition Committee. As one observer noted: "A clever tactic by the AFL. It limits what he has to say externally, but he still holds a lot of power." While he again features at the pointy end of this list, it could be argued that at his own club he ranks No.3. Football boss Geoff Walsh and coach Nathan Buckley shaped Collingwood the most in 2018. There's Clarkson the influencer, who by virtue of his longevity and his success, is across everything that happens in footy. He wasn't on the Competition Committee but didn't need to be when, armed with a laptop and some match vision, he had a highly publicised breakfast meeting with Gill McLachlan to give his views. In any event, not much happens across the competition without him knowing about it and having input if he wishes. "He's a footy obsessive. I don't think he sleeps," said one of his close mates in the game. Last season was the third straight year in which one of his former assistants (West Coast's Adam Simpson) won the premiership, although this time he didn't crash the post-match media conference cradling a cold beer for the winning coach. What he did demonstrate last year was that his focus didn't drift too far in his day job. He did a sterling job steering a middling Hawthorn team to a top-four finish after the home and away season. The Hawks crashed out of the finals in straight sets and have lost Brownlow medallist Tom Mitchell for this season. For Clarkson, that's not a crisis but rather an opportunity. Whether by design or default, we usually knew former Commission chairman Mike Fitzpatrick's position on much that was happening in the game, particularly on the field. But two years into his term as chairman of the AFL Commission, the same cannot be said of Goyder, who observers say is fully immersed in League matters and keen to learn more about what he doesn't know. He might not always be as strident in his views as his predecessor, but he makes them clear once they're known. It is always worth noting that, as a West Australian, his love for the game is deep and longstanding, but he does view the game from outside its often Victorian-centric bubble. "Goyder's Commission has proven a sensible balance to the drive for change out of AFL House," said one broadcaster. "He's changing the moral and integrity compass in the game." Goyder became chairman of Qantas last year, but nevertheless, the AFL signed up with Virgin Australia for another five years last September as its official airline carrier. It is believed Goyder excused himself from the negotiations. It has been a long time since any new arrival at the AFL has wielded as much change within a year as has Hocking. To recap: new judicial and Tribunal processes, new rules and interpretations, headed by the 6-6-6 rule that will lead to real and fundamental changes to the way the game is played, and the shutting down of several key advisory groups to be replaced by the all-powerful Competition Committee. Concerned the AFL's football IP had fallen significantly behind the clubs, he has assembled a group which includes David Rath, James Podsiadly and Brett Munro, among others, whose knowledge of the game and the players will continue to guide Hocking going forward. Mountains of data, hours and hours of consultation, as well as plenty of wisdom underwrite these decisions, and if the end result is the extra three or four goals a game, then Hocking will be hailed a hero. "He will do so much for the game if he's allowed to," said one commentator. Already, Hocking has won over one significant group of stakeholders – the 18 AFL senior coaches. "Without exception, there hasn't been one complaint from any of them," said one industry figure. "There might be micro-issues that emerge from time to time, but there is immense respect and trust." Record crowds, massive membership figures, bumper TV ratings, strong participation numbers, a women's competition that is tracking nicely and a $250 million injection of funds for Marvel Stadium and grassroots football represent another solid year of work by the AFL boss. There's no question he drives the direction of the game and that he's not prepared to stand still. He consults widely, understands threats and challenges and deals with them on the front foot. He is a modern boss and the AFL is a good place to come to work. Like us, he is a footy head, albeit one who is charged with running the sport. But for all the milestones ticked off in 2018, there were a few blemishes and moments he might want to walk back. Fans were rightfully outraged when he floated the idea of using 'dead rubber' games near the end of last season to trial new playing rules and he deservedly copped flak for suggesting the AFLW season be reduced by a week and dug himself a bigger hole by making an incorrect comparison to the FIFA World Cup finals. A thinking-out-loud suggestion about giving Tasmania an AFL team of its own prompted a "put up or shut up" response from Hawthorn president Jeff Kennett. He even made headlines in Canberra when he lobbied the Federal Government for help in stopping the deportation of his cousin's French au pair. Five years into Andrew Demetriou's time, McLachlan had been clearly identified as the CEO in waiting. "In many comparable sized businesses, the board would have discussed succession planning and a clear No.2 within the organisation would likely have been identified. That doesn't seem to be the case at the AFL," noted one analyst.